Here is the list of the hotels near Oberhaslach. Book your hotel near Oberhaslach today, Monday 13 May for the best price, reservation and cancellation free of charge thanks to our partner Booking.com, leader in on-line hotels reservation. Below here is the list the 50 closest hotels of Oberhaslach, sortable according your criteria. You will find the position of these accommodations on the Oberhaslach hotels map. Set between mountains and vineyards at the foot of the Nideck waterfall and the Nideck castle, the St Florent welcomes you in a warm and family atmosphere. Hotel St Florent features 25 comfort or family rooms with a view of the flowery streets of Oberhaslach and the Vosges Mountain. The restaurant offers a traditional menu consisting of delicious Alsatian specialties. The hotel benefits from a privileged location from which you can discover the Vosges region and visit tourist sites like the Mont Saint Odile or the Haut Koenigsbourg. Hotel St Florent has free and secure parking. Located in Niederhaslach, Le Clos du Haslach provides accommodation with free WiFi and flat-screen TV. All units come with a terrace, a kitchen with an oven, and a private bathroom. A microwave is also offered, as well as a coffee machine and a kettle. Strasbourg is 41 km from the holiday home, while Obernai is 24 km away. The nearest airport is Strasbourg International Airport, 35 km from the property. Gite Chez Alice is located in Mollkirch. The holiday home features garden views and is 39 km from Strasbourg. Situated on the ground floor, this holiday home is fitted with with 2 bedrooms, a well-equipped kitchen with a dishwasher and an oven, a living room, and a flat-screen TV. The holiday home offers a barbecue. Gite Chez Alice provides a terrace. Obernai is 11 km from the accommodation. The nearest airport is Strasbourg International Airport, 32 km from Gite Chez Alice. Offering an outdoor pool, barbecue facilities and a terrace, Gîte la Ferme is located in Mutzig. It offers free parking and free WiFi access. The accommodation includes a living room with a TV, a dining area and a fully equipped kitchen with a dishwasher and a microwave. An array of activities can be enjoyed on site or in the surroundings, including hiking. This holiday home is 15 km from Strasbourg International Airport. Ideally located in the heart of Alsace, close to mountains, Hotel The Originals La Fischhutte is an elegant and welcoming 3-star hotel. Set in a lush park, the hotel offers stillness and relaxation. Choose among 18 fully-equipped rooms and suites in which you will enjoy high standards of comfort. All rooms are accessible by lift. Hotel The Originals La Fischhutte has also built its pride on its restaurant serving homemade, quality food to the most demanding gourmets. Give in to the temptation of foie gras and grilled meats. Surrounding this warm establishment, discover the preserved nature of the Magel Valley. Featuring accommodation with a terrace, Gîte le Bambou is set in Dinsheim. The property has mountain views. This 3-bedroom apartment includes 1 bathroom equipped with a bath and a hair dryer. The kitchen is equipped with a dishwasher. There is a garden at this property and guests can go cycling nearby. Strasbourg is 31 km from the apartment, while Obernai is 15 km from the property. Strasbourg International Airport is 25 km away. Ideally located near the Alsacian Wine Route, 35 minutes from Strasbourg, Parc Hotel is an elegant 3-star hotel set in a lush botanical garden. Free WiFi and free parking are available. Choose among elegant and modern rooms, some with a balcony or a soothing view of the garden or the valley. The hotel also boasts large living rooms with beautiful woodwork in which to enjoy a relaxing moment or play billiards among friends. Take a refreshing dip in the hotel's indoor swimming pool and challenge your friends on the tennis court. Relax in the sauna, hot tub and hammam. End the day with a tasty dinner prepared with fresh ingredients by a team of dedicated cooks. The Parc Hotel is ideal for a relaxing holiday or as a starting point for trips and popular hiking paths. The Parc's team will also be proud to give you the chance to taste some of the best local wines. Guest accommodation Mutzig Preferred hotel ! Zenitude Hôtel-Résidences Les Portes d'Alsace is set along the Alsace Wine Route, 25 km from Strasbourg in the village of Mutzig. It offers a sauna and studio and apartment accommodation with free parking. The studios are equipped with a private bathroom, seating area with flat-screen TV and a kitchenette featuring a hotplate, microwave and refrigerator. Zenitude Hôtel-Résidences Les Portes d'Alsace can provide a breakfast service upon request. The residence is near the town’s famous 19th-century brasserie and is a 5-minute drive from Mutzig Fort. Set in the heart of the Alsace region, Le Freudeneck is located in Wangenbourg-Engenthal. It offers a restaurant serving traditional Alsatian food and a bar, just 15 km from Sauverne. An LCD TV with satellite channels and a DVD player are standard facilities in the rooms at Le Freudeneck. Each has a private bathroom with amenities and some feature wood paneling. Decorated in a style typical of the region, the restaurant has original wooden beams and serves a buffet breakfast daily. On sunny days, guests can dine on the terrace that looks onto the hotel’s large garden. Wi-Fi is free throughout the hotel and private parking is available on site. There is also a children’s playground and an area where guests can play pool or darts. Strasbourg is 35 km away. Located at the start of the wine route of Alsace, the friendly and comfortable hotel L'Ours De Mutzig is located just 20 minutes from Strasbourg and 45 minutes from Colmar. The rooms are fully equipped with satellite TV, work desk and en suite facilities. Facilities include a traditionally decorated reception area with fireplace, seminar rooms, breakfast each morning, garden and outdoor swimming pool. The Ours Hotel Restaurant is open for dinner and offers tasty local cuisine in a traditional brasserie setting. The central but quiet location in the centre of Mutzig is ideal for exploring the cultural and historical heritage of the region. Private parking is available for guests. Guest accommodation Rosenwiller Preferred hotel ! Set in Rosenwiller in the Alsace Region, on the Alsatian Wine Route, this detached holiday home is 30 km from Strasbourg and 9 km from Obernai. Guests benefit from free WiFi and private parking available on site. A dishwasher and an oven can be found in the kitchen. Towels and bed linen are featured at Gite Le Petit Moulin. There is a private bathroom with a shower. You can play darts at the property, and free use of bicycles is available. Colmar is 58 km from Gite Le Petit Moulin, while Riquewihr is 39 km away. Guests can enjoy various activities in the surroundings, including cycling and hiking. The nearest airport is Strasbourg International Airport, 26 km from the property. 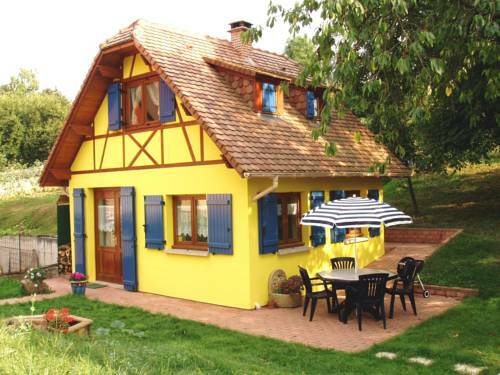 Featuring a garden with a barbecue, Gite en Alsace is a detached holiday home located in Mutzig in the Alsace Region. The unit is 22 km from Strasbourg and a 50-minute drive from Colmar. There is a seating area and a kitchen complete with a dishwasher, an oven and a microwave. A flat-screen TV and Blu-ray player, as well as a CD player are featured. Other facilities at Gite en Alsace include 2 terraces with outdoor furniture. Riquewihr is 42 km from Gite en Alsace, while Rust is 35 km away. You can engage in various activities, such as cycling and hiking. The nearest airport is Strasbourg International Airport, 12 km from Gite en Alsace. A free private parking is available on site. Set in the verdant environnement at the foot of Mont Saint Odile in the heart the Alsace, sits the Hotel Restaurant Des Vosges, a charming and peaceful establishment. All of the 3-star guest rooms are comfortable and well equipped with private bath facilities, TV and High-Speed internet access. Rooms are serviced by a lift and non-smoking rooms and rooms with private balconies are also available upon request. Enjoy delicious traditional and regional cuisine in the hotels restaurant. It is open from Wednesday lunchtime through Sunday lunch time. If you wish to dine in the hotel, it is recommended that you call the hotel in advance. The Hotel des Vosges also offers other services such as a sauna, hot tub and an indoor swimming pool. Situated in the medieval city of Boersch, this self-catering cottage features a half-timbered façade and a private courtyard with outdoor furniture and barbecue facilities. Free Wi-Fi and free private parking are provided on site. Gite Dans Cite Medievale includes a fully equipped kitchen with dishwasher, coffee machine and microwave. There is also a living room with an LCD TV and a bathroom with shower and washing machine. Some restaurants, shops and bakeries can be found 100 metres away. Located only 4 km from Obernay, Gite Dans Cite Medievale is 5 km from Obernai Train Station and 6 km from the A35 motorway. Offering an outdoor swimming pool, free garage parking and free WiFi, Gite Habsiger is located in Ottrott. Guests can relax on the terrace, by the garden. The accommodation features a flat-screen TV and a balcony with garden view. Featuring a shower, the private bathroom also comes with a hairdryer. You can prepare meals using the apartment’s open-plan kitchen, which is equipped with a dishwasher, a oven and a microwave. Gite Habsiger is a 10-minute drive from Obernai and 18 km from Strasbourg Airport. Mont Sainte-Odile is 2.8 km from the accommodation. Located a 25-minute train journey from Strasbourg, L'Oberstadt offers accommodation in Rosheim. The holiday home is equipped with air conditioning and free WiFi. There is a seating area and a kitchen equipped with a dishwasher. A flat-screen TV is featured. There is a private bathroom with a bath and bath or shower. Rosheim Train Station is only a 5-minute drive away. Colmar is 47 km from L'Oberstadt, while Riquewihr is 38 km away. Guests can enjoy various activities in the surroundings, including skiing, horse riding and cycling. The nearest airport is Entzheim Airport, 13 km from the property. Located in Rosheim, Aux oiseaux de passage provides accommodation with a terrace and free WiFi. Guests staying at this apartment have access to a fully equipped kitchen. The apartment features a flat-screen TV and 2 bedrooms. The bathroom has a shower and a hair dryer. If you would like to discover the area, cycling is possible in the surroundings. Strasbourg is 31 km from the apartment, while Colmar is 55 km from the property. The nearest airport is Strasbourg International Airport, 25 km from Aux oiseaux de passage. Offering an on-site restaurant, Le Dormeur is a hotel located in Dorlisheim. You can relax on the terrace with a drink from the bar. Strasbourg International Airport is 11 km away. With a contemporary décor, each room features a flat-screen TV, air conditioning and a seating area. A desk and a safety deposit box are also provided. Each room also includes a private bathroom with a bath or shower and free toiletries. At Le Dormeur you will find a terrace and a bar. Other facilities offered at the property include meeting facilities. The property offers free parking. Guests can access to the sauna and hot tub with an extra cost. This 2-star hotel is situated within 40 hectares of forest on Alsace’s wine route. It offers guest rooms and self-catering apartments with flat-screen TV and free Wi-Fi access. The accommodations at Domaine Le Moulin are spacious and have a private bathroom with bathtub. All have elevator access and some have a balcony or terrace. A continental breakfast can be delivered to guest’s rooms every morning. Traditional and gourmet dishes are served in the hotel’s 3 dining rooms. The hotel is 4 km from the scenic village of Obernai and 8 km from Obernai Train Station. Strasbourg is 36 km from Domaine Le Moulin. Free private parking is available on site. Located in Rosheim, Maison d’hôtes La Rose d’Alsace dates back to the 18th-century and offers a garden, terrace and hiking tours. The property is set on the Alsace Wine Route and is just a 25-minute drive from Strasbourg. All rooms feature a view of the garden, a flat-screen TV with cable channels, a wardrobe and a Nespresso coffee machine. The en suite bathroom features a shower or a bath. A breakfast including hot drinks, bread, butter, jam, juice, yogurt and Alsatian cakes is provided each morning. Traditional cuisine can be found in the several restaurants situated in Rosheim. Guests can go winetasting just 100 metres from the property and Obernai is a 10-minute drive away. Free WiFi access is provided throughout and free public parking is possible at a location nearby. This Charming 4-star hotel is located at the foot of the Sainte-Odile Mountain, 36 km from Strasbourg and Colmar. It is set in a 6-hectare park and offers a spa. All guests of the Hôtel Le Clos Des Délices Restaurant & Spa recieve free access to the spa, which includes an indoor jet-stream pool with a panoramic view over the garden, a sauna, a counter-flow pool and an outdoor hot tub. The Hôtel Le Clos Des Délices Restaurant & Spa also has a restaurant, which serves French and gastronomic cuisine. Meals can be enjoyed in the dining room or on the outdoor terrace. The air-conditioned rooms at the Clos are all individually decorated and have free WiFi access. Two charging stations for electric cars are available at this property. Set in Rosheim in the Alsace region, Nid de cigognes provides accommodation with free WiFi. Units feature a fully equipped kitchenette with a microwave, toaster, coffee machine and kettle. Some units include a dining area and/or a balcony. Hiking can be enjoyed nearby. Strasbourg is 30 km from the holiday home, while Rust is 47 km from the property. The nearest airport is Strasbourg International Airport, 24 km from the property. Gite Niedermatten is a 1-bedroom house with exposed wooden beams located in Boersch, just 4 km from Obernai and 29 km from Strasbourg. It offers free Wi-Fi internet access as well as a terrace. The accommodation will provide you with a seating area and a cd player. There is a full a kitchen with a dishwasher and a microwave. Featuring a shower, the private bathroom also comes with a hairdryer and towels. Free parking is provided on site and shops and restaurants are found within 500 metres of the house. The property is 30 km from the German border and a 25-minute drive from Sélestat. Appartement des Biches is a semi-detached holiday home located in Birkenwald in the Alsace Region and is 30 km from Strasbourg. You can fire up the barbecue for a tasty meal and enjoy the garden in fair weather. The kitchen comes with a dishwasher and an oven, as well as a coffee machine and a kettle. A flat-screen TV is available. Other facilities at Appartement des Biches include a sun terrace and a Petanque court. You can play table tennis at the property, and the area is popular for cycling and hiking. Obernai is 24 km from Appartement des Biches, while Kirrwiller is 23 km from the property. The nearest airport is Strasbourg International Airport, 24 km from the property. Two-Bedroom Holiday Home in Dabo is located in Dabo. Guests staying at this holiday home have access to free WiFi. The holiday home is fitted with a TV, 2 bedrooms and a living room. A dishwasher, an oven and a microwave can be found in the kitchenette. Strasbourg is 43 km from the holiday home, while Obernai is 45 km away. Strasbourg International Airport is 39 km from the property. Loft De Rosheim is a holiday home located in Rosheim in the Alsace Region and is 22 km from Strasbourg. The property is 47 km from Colmar and free private parking is featured. Free WiFi is available throughout the property. Other facilities at Loft De Rosheim include a courtyard. The area is popular for skiing and cycling. Riquewihr is 39 km from Loft De Rosheim, while Rust is 32 km from the property. The nearest airport is Strasbourg International Airport, 13 km from the property. Below here is the hotels map of Oberhaslach. Names and details of Oberhaslach hotels can be shown on the map clicking on the prices icons.